We’d love your help. 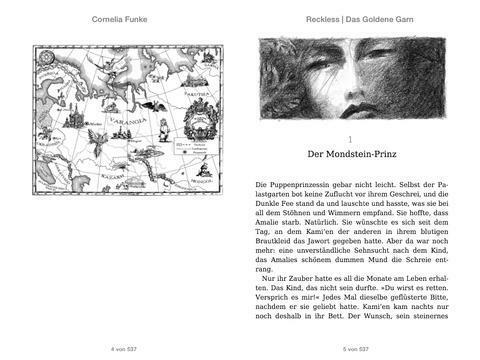 Let us know what’s wrong with this preview of Das goldene Garn by Cornelia Funke. To ask other readers questions about Das goldene Garn, please sign up. So it isn't out yet? Does anyone know when the English translation is going to be avaliable? I'm dying to read this. Jack 01/12/15. You can find out more at http://www.breathing-books.com. That was so enigmatic! I feel like I just want to curl into a corner and cry. When speaking of this book I just want to say, that I remembered next to nothing of the books prior to this in the series. So basically it was like being a confused puppy! But it was such a great book, the prior introductions weren't as necessary as one would assume. Jacob reckless, I mean even the choice of name makes you cringe with excitement. There was so much dynamic between characters, so much innovation in retold f That was so enigmatic! I feel like I just want to curl into a corner and cry. Jacob reckless, I mean even the choice of name makes you cringe with excitement. There was so much dynamic between characters, so much innovation in retold fairytales and stories that I just couldn't keep up at times. Ich liebe Fuchs und Jacob. Ich hasse die vielen Perspektivwechsel. Uuuuund der rote Faden fehlt. So könnte man meine Erfahrung mit diesem Buch in wenigen Worten in etwa zusammenfassen. Wenn ich an Reckless denke, dann schwanke ich grundsätzlich zwischen Begeisterung und Langeweile. Ich muss dabei sogar gestehen, dass ich Teile dieses dritten Buches nur überflogen habe, anstatt sie komplett zu lesen. Das Worldbuilding, der beeindruckende Schreibs Ich liebe den Schreibstil. So könnte man meine Erfahrung mit diesem Buch in wenigen Worten in etwa zusammenfassen. Wenn ich an Reckless denke, dann schwanke ich grundsätzlich zwischen Begeisterung und Langeweile. Ich muss dabei sogar gestehen, dass ich Teile dieses dritten Buches nur überflogen habe, anstatt sie komplett zu lesen. Das Worldbuilding, der beeindruckende Schreibstil und auch die tollen Charaktere reichten in diesem dritten Band einfach nicht mehr aus, um mich durchgehend an die Geschichte zu fesseln, auch wenn all diese Dinge noch immer wundervoll waren. Vielleicht hat es auch damit zu tun, dass es hier ein unnötiges Liebesdreieck gibt, nachdem Fuchs so lange für Jacobs Aufmerksamkeit hat kämpfen müssen und ich seine Begründung, warum die beiden nicht zusammensein können, lachhaft finde. Jacob darf keine Kinder bekommen. Und jetzt? Wäre Jacob unfruchtbar, würde Fuchs ihn dann verlassen? Würde er ihr dann diese Entscheidung abnehmen? Das ist eine Entscheidung, die Fuchs zu treffen hat, nicht Jacob. Mal ganz davon abgesehen, dass es selbst in einer Welt wie der von Reckless so etwas wie Adoption geben sollte. I'm so addicted to this series it's becoming ridiculous. I just wanted to rush through and read the whole thing because LOVE ... but I also wanted to read slowly so it never ended?!? Do you see the PROBLEM HERE?!? I just can't get over how darkly and beautifully magical it is and how it manages to make me feel all things and be so deeply in love with the world and characters that I'm just basically a small puddle of adoration. Also a small puddle of despair because the next book is NOT IN MY LIFE I'm so addicted to this series it's becoming ridiculous. I just wanted to rush through and read the whole thing because LOVE ... but I also wanted to read slowly so it never ended?!? Do you see the PROBLEM HERE?!? I just can't get over how darkly and beautifully magical it is and how it manages to make me feel all things and be so deeply in love with the world and characters that I'm just basically a small puddle of adoration. "The Golden Yarn...or the inseverable bond, as it is also called. As inseverable as the threads of fate." I'm very sad that this is the last Mirrorworld book that is currently published. Who knows how long we will have to wait until the next one! Sigh. However! Once again a wonderful trip into this amazing world full of magic, villains and secrets. Jacob and Fox are swept up into so many different tasks and treasure hunts; Jacob's brother Will once again follows him through the mirror to "The Golden Yarn...or the inseverable bond, as it is also called. As inseverable as the threads of fate." However! Once again a wonderful trip into this amazing world full of magic, villains and secrets. Jacob and Fox are swept up into so many different tasks and treasure hunts; Jacob's brother Will once again follows him through the mirror to search for a remedy for Clara as something has been done to her - something not of our world. 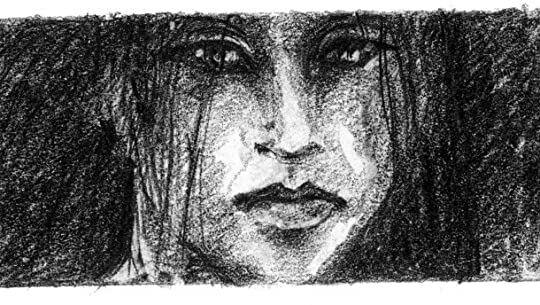 The Dark Fairy is still around, but her love for the King of the Goyl (or the stone men) is causing her nothing but pain, and she would do anything to sever the bond between them caused by love. Jacob also comes into contact with his father after about a decade, but it isn't the tearful reunion we would expect! All the old characters are in this book as well as plenty of new ones. That would be my only gripe that stopped this one from being 4 stars, the number of characters - all with different names and nicknames, as well as each chapter following a different person or set of people made it ever so slightly more difficult to follow than the previous two books were. Otherwise, a magical and engaging story with lots of twists. Jacob has a debt that is owed from book 2, and it is only a matter of time until it will be paid. "He took her to be stupid, like all women. The discarded mistress of a King. Love had made her so small." I always find it impossibly hard to review Cornelia Funke's books. The thing is, they are complicated, they are convoluted and many-sided, their plots are like clocks put to work by some inconceivably refined gears, and the very same definition can be applied to their characters. In books like hers, there are wheels within wheels and worlds within worlds and secrets you will never uncover, no matter how hard you try. That's good luck. That's the worst of curses. For it means that thankfully you qill never run out of hidden details to discover, but also that you will always keep wandering what little marvel you have not been able to figure out yet. The Golden Yarn is no exception. It is a wonderful book. Magnificent. Enchanting. Mesmerizing. Fairy tales' lovers like me cannot avoid being totally entranced by it like childrens by their bedtime stories. And I am not talking about a purely aesthetic quality: the world behinf the mirror will delight you, but their inhabitants' -our characters'- stories will strangle your hearts. Funke can ensure that you find yourself out of breath page in, page out, even for those characters you thought you did not care about. Obviuos example: Kami'en and the Dark Fairy. They almost brought me to tears. And I am not one for tears. The Dark One, above all, in this book gave her best: I hadn't given her much attention before, and surely not the attention she deserved, but reading this book I realized how deep her characterization digs, and all the dirt that it brings out, all the self-hatred and the shame, the longing, an abyss of longing, the fragility and the firmness, the fear of not being herself anymore, and all for love's sake. She was simply marvellous. And then there were Jacob and Fox. "How clear one's own desires become once they are made impossible." I have been waiting to see them together since the first book, and they didn't disappoint me, but still it wasn't perfectly perfect. But maybe it's just me that have been building too many castles int he clouds. What I found more disappointing, instead, was the writing. Which is quite strange, because I have always loved Funke's writing, and still here I am saying it: in my opinion and given how gifted Cornelia is, this book could have been written much, much better. This resulted in me having some issue with the narrative and its pace -more the 'single-event pace' than the overall pace: moments on which it felt natural to linger where quite rushed and vice versa. It felt annoyingly unnantural and I know Funke knows betterthan this, so I wasn't properly happy about it. But, needless to say, I loved the book all the same. I loved many of Cornelia Funke's earlier novels, particularly the charming Inkworld series. She's an imaginative and original voice. These books were suitable for children and adults. Alas, I haven't felt the same way about the "Mirrorworld/Reckless" series. These are darker. They're supposed to be dark romantic fairytales for adults. Think "Through the Looking Glass" but much darker and not humorous. The series tracks the adventures of Jacob Reckless and his friends and enemies and various magical creatures (elves, fairies, creatures made of glass, goyle--who have stone skins, etc). Jacob is a renowned treasure hunter in the Mirrorworld. He found his way there by surreptitiously following his father from our world (the "real world") through an enchanted mirror to the Mirrorworld. But for some reason, the Reckless/Mirrorworld books don't seem to work as well as the Inkworld novels. It's hard to pinpoint exactly why though. The plots are convoluted and the characters unsympathetic. (That's just part of the problem). As usual Funke is very creative and good at world building, but it's hard to care about most of the people (except for Fox, an appealing shape shifter). The central conceit of the book, that a magical "golden yarn" ties lovers together whether they like it or not, never came to life for me. This time we're crossing into unknown territory so there is even a map at the beginning of the book (or maybe the publisher only included it because it's fashionable now). Anyway, there are as few illustrations as in the second book (only at the beginning of the chapters, meh) but they are as gorgeous as ever (yay)! As you know by now, Jacob and Fuchs are still a team and we're still travelling through the world behind the mirror that gets savaged by progress (yes, I don't like it one bit), the wa This time we're crossing into unknown territory so there is even a map at the beginning of the book (or maybe the publisher only included it because it's fashionable now). As you know by now, Jacob and Fuchs are still a team and we're still travelling through the world behind the mirror that gets savaged by progress (yes, I don't like it one bit), the war with the Goyl and the ramifications of the two previous books. However, this time we're moving far to the East, to what is Russia in our world. Varangia it's called in Mirrorworld and full of tame bears wearing human clothes, fire birds, Russian witches (Baba Yagas), colourful houses, lots of magical items and old old old forests that I wish so much still existed in our world today. As characters, there is the so-called "Spieler" (player), an Erlelf, who definitely isn't a good guy. What happened to him and his kind was not very nice but apparently they had been bad before and are now simply seeing themselves as victims, using every available resource (and there are many) to get their revenge although their punishment was justified. Revenge is the general force for Will (Jacob's younger brother) too. I must admit that I don't like Will very much. In the first book he was a victim, lost in an unknown world, needing his brother, being overwhelmed by a curse. In this book he was supposed to be a victim of Spieler's too, but he was just so whiney and selfish on one side, completely stupid and annoying on the other, so I couldn't sympathize with him. And we get to see John Reckless, Will's and Jacob's father. I'm not sure I should start writing about this man. In short: I HATE HIM! With all my heart! Not enough that he abandoned his family, no. He's addicted to fame and glory while simultaneously being the greatest coward that ever lived. He's the one bringing all the progress to Mirrorworld for which alone I'd want to kill him. But he also has no real interest in his son, even when he's standing right in front of him and uses every person in his life just as long as they are deemed good/useful enough. Urgh! You have to read it all to understand the dimension of his awfulness. Unfortunately he does not die a violent death in this book like I had hoped. As a new character we get a man from our world. That was spicing things up a bit and creating a few quite funny interactions. Also, I think, he's the one bridging the story to book 4 and its' setting (the Mirrorworld version of Canada, I think). It was also nice to have the old characters like Alma the witch and Chanute again. It balanced the whole thing and showed where Jacob really belongs. And it made up for all the awful chapters about our world in the first third of the book (they were written as wonderfully as the other chapters but I don't want to read about our world, I like Mirrorworld much better, just like Jacob, and couldn't get behind the mirror soon enough). And then we have Jacob and Fuchs. I usually hate when love stories are included but here I was really rooting for them. Having met when Fuchs was a little girl (before the first book) and having been the bestest of friends, they grow to need one another. At first only like friends, then like brother and sister and then ... well. Thanks to the fox fur that makes Celeste (Fuchs' human name) shapeshift, she's also aging sooner (which is logical considering that most animals, foxes in particular, age faster than humans). In the second book her age and that of Jacob caught up with one another and after what happened at the end of book 2, not even they can deny their feelings any longer. But thanks to Spieler, it's complicated. I usually really hate that because it's unnecessary drama but here it's never too much. Sure, the suspense was killing me, but it was still fairly realistic (considering we're in a world where fairy tales are true). And yes, there is a happy ending. Sort of. Well, it is happy for these two and that's all I really wanted (that's a lie actually, I'll explain later). And then the end of the book. So many questions! (view spoiler)[What happens to Kami'en's son?! How many mirrors are there and have the others gone through too so we'll be rid of the Erlelfen soon or will the others think of something else? How soon will the still lasting curse work on Spieler? Who is the fae's white hope (to me, there are two possibilities)? What will become of Will and Nerron and Sixteen? Thanks to a conversation with the author, I know there will be more books. If the author has any say in it, it will be 3 more. And I think I know where the 4th will be taking us (at least in part, it's possible she will have to split the narratives to show happenings on two different continents). I can only hope that I won't have to read too much from John Reckless' and only a few chapters (until the whole Spieler-thing is resolved) from Will's POV! But the new continent should make a very interesting setting for lots and lots of new magic and I know that Native Americans / Native Canadians have lots of great tales and magical creatures. See you (soon I hope) on the other side of the mirror! This book started out really slow and took forever to actually build some kind of interesting story. The world and all it's fascinating details were beautiful, but it still lost it's magic for me. Only the last 100 pages really pulled me in again like the previous books did and convinced me that Cornelia Funke still hasn't lost her talent to enchant you with her words and world building. The characters were not as endearing as I remembered them, I honestly liked some of the supporting characters This book started out really slow and took forever to actually build some kind of interesting story. The world and all it's fascinating details were beautiful, but it still lost it's magic for me. Only the last 100 pages really pulled me in again like the previous books did and convinced me that Cornelia Funke still hasn't lost her talent to enchant you with her words and world building. The characters were not as endearing as I remembered them, I honestly liked some of the supporting characters more than the main characters (I looved Orlando and Dunbar). I didn't really care for Jacob and Will, I even had more sympathy for the Dark Fairy. Finally. I was looking forward to this book for quite some time. 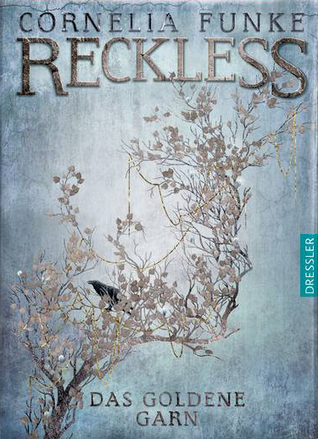 I know many people disliked „Reckless“, because of its difference from Funke’s other books, especially Inkspell. Well, I admit I wasn’t very smitten with the first book in the first place, but it really crept up on me. I have read the series twice now, which is a pretty good idea before reading the third book. Just so you are back on track. This is one of these rare occasions where I like the second book much better than the first. Finally. I was looking forward to this book for quite some time. I know many people disliked „Reckless“, because of its difference from Funke’s other books, especially Inkspell. Well, I admit I wasn’t very smitten with the first book in the first place, but it really crept up on me. I have read the series twice now, which is a pretty good idea before reading the third book. Just so you are back on track. This is one of these rare occasions where I like the second book much better than the first. Cornelia obviously grew accustomed to the new story-world. You could see/read how more at ease she must have felt with the 2nd novel and you can feel how much fun she seems to have writing these novels, because you can sense her passion in every word. Yes, she borrows a lot of the fairy-tale world, but that’s exactly the point here. And by the way, you would be quite shocked that not many of the old masters of fairy-tales really wrote those stories themselves…They all copied it somewhere. 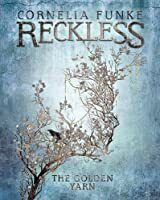 It is such a great world Funke built up in the Reckless series. Also the characters are wonderful and thoroughly developed. You know how to work out, if a book is really good? When you read and read and the remaining pages diminish, you are devastated, because you only have about 200 pages left! And you wished there were another 500 pages. that doesn’t happen with bad books. (Ok, it also happens when you read a good book that is damn hard to read…believe me, reading War and Peace…you do not wish there were a 500 pages more of it to read.) Anyhow, this is the main fault I see here. The book is very easy to read through and somehow you could definitely have more of it. The story picks up some unknown time (some days or some weeks) where book two ended. Jacob and Fox are still in Jacob’s world. They get to NYC to visit Will and Clara, also Jacob wants to pay the MET (Metropolitan Museum of Art in New York City) a visit in order to get rid of the crossbow for some time. way through the Bluebeard’s labyrinth. Earlking tells him what he wants, which leaves Jacob devastated and he is now more decided than ever about suppressing his feelings. Will is also dragged in to the Mirrorworld again, going on a hunt together with Nerron. He, too is manipulated by Earlking, who wants him to do a dark deed for him. Kami’en’s and Amalie’s baby is born, but vanishes and everyone suspects the Dark Fairy. She flees, going on her own hunt to find something that will free her. So we do have a lot of different plot line this time, which is a bit bothersome sometimes, because often you feel pulled out in order to read about something, which doesn’t interest you that much at the moment. The many different POVs were a bit too much for my taste and somehow did not leave room enough for more interesting parts. I missed the long dialogues and interactions between Fox & Jacob, although there was a good reason they kept apart this time. I had the impression Jacob didn’t get that much screen time. Still I have to sing high praises. I like Cornelia Funke’s books better with each one. Her world-building is marvelous, her characters are just wonderful. We meet new characters and old acquaintances. Especially I liked that Chanute was in the game again and had a bigger part than last time. We leave Albion and Austria to visit Varangia in the east. Thus there is a whole lot of new treasures, creatures and magic to discover. Again, Funke’s writing is very descriptive and you can see everything quite clearly. It was too short. And here you have it again, my complete and inner torment with the literature franchises. This is so not cool. Always the obsession with dividing a story, what could be done in one or two books, into seven…Ok, ok, I hear you. I’m stopping right here! It is frustrating to wait 2 years or more for the next one. Oh yes my friends, there will be a next one and I am pretty sure Cornelia Funke is enjoying herself in this fairy-tale world far too much, to give it up quite yet. I am counting on at least two more. And she is already working on the next I heard. Recommends it for: chi vuole scoprire misteri antichi. Jacob e Volpe ci avevano lasciato con il fiato sospeso nell’avventura precedente. E riprendiamo le vicende proprio dove si era concluso il libro precedente, con un nuovo e pericoloso avversario. Ovviamente aver recuperato un’arma incredibile e potente rischia di attirare troppe attenzioni, specie se non si sa bene come maneggiarla. Jacob purtroppo dimostra ancora una volta come il desiderio e la realtà siano due cose completamente differenti. Il nostro protagonista vorrebbe solo godersi la felicità dopo essere sopravvissuto a una terribile condanna, ma qualcuno non è dello stesso avviso. Il suo carattere ostinato, molto utile nelle avventure più pericolose, può rivelarsi un’arma a doppio taglio nei suoi rapporti con Volpe. In alcuni casi ho visto Jacob molto scostante, non riesce a capire come riuscire a conciliare il suo cuore e ciò che invece gli dice l’istinto. Volpe invece è cresciuta ed è maturata grazie anche a tutte le vicissitudini che ha dovuto affrontare. Il suo nuovo approccio alla vita mi è piaciuto un sacco. Ha capito che se vuole qualcosa, deve lottare per ottenerla e non sarà mai indolore. Scopriamo qualcosa in più sul suo passato e appare sempre più come un personaggio complesso e sfaccettato. Volpe è una costante nella vita di Jacob, quasi quanto suo fratello, ed è giunto finalmente il momento in cui può dimostrare quanto vale. Il mondo oltre lo Specchio nasconde alcuni aspetti che non avremmo immaginato. La guerra che è sempre rimasta sullo sfondo delle vicende di Jacob sembra quasi scomparire in confronto al nuovo conflitto che si sta delineando all’orizzonte. La magia e le antiche credenze diventano fondamentali per capire come affrontare il nuovo nemico. Ihr ist die Puste ausgegangen. Das habe ich zum Schluss dieses Bandes gedacht. Immerhin sind über 2 1/2 Jahre ins Land gegangen, seit dieser Band erschien und es ist immer noch keine Fortsetzung am Buchhorizont zu sehen. Nicht dass Cornelia Funke aufgehört hätte zu schreiben. Sie hat nur diese Reihe ad acta gelegt. Zwischen Band 1 und Band 2 lagen zwei Jahre, der dritte kam nach 2 1/2 Jahren und nun? So kann man keine Bücher lesen. Das ist eine zusammenhängende Reihe. Wenn Autoren es nicht schaf Ihr ist die Puste ausgegangen. Das habe ich zum Schluss dieses Bandes gedacht. Immerhin sind über 2 1/2 Jahre ins Land gegangen, seit dieser Band erschien und es ist immer noch keine Fortsetzung am Buchhorizont zu sehen. Nicht dass Cornelia Funke aufgehört hätte zu schreiben. Sie hat nur diese Reihe ad acta gelegt. Zwischen Band 1 und Band 2 lagen zwei Jahre, der dritte kam nach 2 1/2 Jahren und nun? So kann man keine Bücher lesen. Das ist eine zusammenhängende Reihe. Wenn Autoren es nicht schaffen, eine Reihe in angemessener Zeit zu schreiben, sollten sie es sein lassen. So lassen sie ihre Leser im Stich. Es ist ja nicht so, dass Cornelia Funke nicht schreibt. Die Feder eines Greifs kam 2016 heraus, eine Fortsetzung von Drachenreiter von 1997. Schöne Aussichten, kann ich da nur sagen. Wahrscheinlich kann Drachenreiter als Buch für sich stehen. Das goldene Garn kann das nicht. Das ist ein Zwischendrin-Band mit zig losen Enden. Es gibt etliche Handlungsstränge und dessen Figuren sind alle auf dem Weg irgendwo hin. Alle mögliche wird angeschnitten. Trotzdem hat man das Gefühl, dass im Gegensatz zu Band 1 nicht wirklich etwas passiert. Und dann endet das Buch einfach. This might be my favorite book of the year and one of my new favorite book series. This is just so good and eerie and amazing! I'm in love. Yeah, well, so much for that. Mit Reckless: Das goldene Garn und mir wollte es generell nicht so ganz funktionieren und ich bin unsicher, woran es liegt. Am Buch oder daran, dass ich fast drei Monate dran gelesen habe. Es hat durchaus spannende Passagen – für die Charaktere steht tatsächlich etwas auf dem Spiel und die Situation wird zunehmend kompliziert: Die Erlelfen mischen wieder mit und sind so machtvoll wie gefährlich, Will ist auf der Suche nach sich selbst und Clara ist wie immer im Kreuzfeuer gefangen, Jacob und Fuchs‘ Liebe steht unter einem unguten Stern, die Dunkle muss unsichere, politische Situationen meistern. Es gibt neue Erkenntnisse, weitere Verwicklungen und in manchen Situationen kann es einfach keine Gewinner*innen geben. Außerdem fand ich es sehr schön, wie sexuell frei Funkes weibliche Charaktere sein können, ohne dass wer deswegen verurteilt wird, weder vom Text noch von den anderen Charakteren. I'm still trying to catch my breath after this tremendous book. I'm amazed and can barely put a name to what I'm feeling. "Incredible", "Amazing", "Unbeliable", "Breathtaking"... Pick one, whatever you like the most. That's what I'm feeling, and more. Maybe this is my fanatic spirit talking, but Cornelia definitely deserves every praise that I could think of for this book. After years of waiting, I finally could return to MirrorWorld. Along this three books, this world, that began as Jacob's dre I'm still trying to catch my breath after this tremendous book. I'm amazed and can barely put a name to what I'm feeling. "Incredible", "Amazing", "Unbeliable", "Breathtaking"... Pick one, whatever you like the most. That's what I'm feeling, and more. Maybe this is my fanatic spirit talking, but Cornelia definitely deserves every praise that I could think of for this book. After years of waiting, I finally could return to MirrorWorld. Along this three books, this world, that began as Jacob's dream, grew darker and darker, until it ended being his nightmare. That's one of the great things about Cornelia's worlds, for me. They're magical, like farytales, but they always, always, have dark secrets and traps beneath the beauty. And Jacob, Will, Fux and all the other characters are tangled between its threads. Not even the "bad guys" can escape from the threads. All in all, this is a love story. Love like a blessing, and a curse. Love like a thread that can unite as it can choke to death to the people that fall in it. Another good thing about this story is that it was totally unexpected. Every time I thought that I knew what this characters were going to do next, the story gave a different turn. The characters are surprising too, complex and deep. Will, Jacob's brother, was one of the best turns of this book, but Jacob and Fux are still very, very good characters. The new characters add a new layer to the already complicated relationships of Jacob, Will, Fux and Clara. Auch der dritte Teil der Reihe ist für Fantasy-Fans ein absolutes Muss - neue Länder und neue Figuren zeigen die Spiegelwelt noch vielfältiger! Schön finde ich die Entwicklung der Liebesgeschichte zwischen Jacob und Fuchs und das offene Ende, welches die Vorfreude auf eine Fortsetzung noch größer werden lässt. Für mich hatten die ersten beiden Teile mehr Spannung, trotzdem absolut zu empfehlen! Leider nicht so gut wie die Vorgänger. Aber trotzdem bin ich froh, diese Reihe gelesen zu haben. Bin gespannt wie es weiter geht. Nur 4 Sterne, weil es einfach zu wenig ausgearbeitet ist. Das ganze könnte tiefer gehen. Ansonsten mag ich Jacob und Fuchs einfach sehr! Wir mussten sehr lange auf die Fortsetzung zu Reckless warten, um so größer war dann natürlich die Freude als es endlich erschienen ist und ich es in meinen Händen halten konnte. Noch am selben Tag fing ich also an zu lesen und schon war ich wieder mitten in der Spiegelwelt gefangen. Cornelia Funkes Schreibstil ist gewohnt großartig. Sie beschreibt genau so viel, dass dem Leser Bilder vor dem inneren Auge erscheinen, aber nicht so viel, dass die Geschichte sich unnötig in die Länge zieht oder gar zäh wird. Er hat darüber hinaus für mich etwas einfach magisches - dass Cornelia Funkes Bücher zu denen gehören, die mein frühes Leseverhalten geprägt haben, spielt da wohl auch mit rein. Auch bewundere ich es immer wieder, wie sie es schafft, ganze Welten zu erschaffen und die so zu gestalten, dass ich aus ihnen nicht mehr weg möchte. Es gibt wirklich wenige Autoren die es verstehen, Welten so zu erschaffen, dass sie aus sich selber heraus weiterleben ohne das Buch und sogar ohne den Autor. Cornelia Funke gehört definitiv zu diesen wenigen Autoren. Dementsprechend große Freude hat es mir nun wieder bereitet, in diese einmalige Welt abzutauchen. So viele neue Dinge konnte ich entdecken und Dinge, an denen ich schon in den vorherigen Bänden großen Gefallen gefunden haben, hießen mich nun wieder Willkommen. Dass die Welt mit Märchen verbunden ist, klingt vielleicht erst einmal nicht so besonders, denn es gibt heutzutage ja viele Fairy Tale Retellings. Dass diese aber komplett anders sind als Reckless sollte wohl erwähnt sein. Denn Cornelia Funke erzählt keineswegs ein Märchen nach, nein, sie integriert sie in ihre eigene, selbständig bestehende Geschichte. Und es sind auch keineswegs nur grimm’sche Märchen. Die Märchen stammen aus den verschiedensten Kulturkreisen. Immer wieder stolpert der Leser so über ein für ihn neues Märchen, was durchaus sehr interessant sein kann. Die Geschichte ist aus verschiedenen Perspektiven erzählt, die sich perfekt ergänzen und einander nichts vorwegnehmen. Dies - kombiniert mit einer an sich schon sehr spannenden Handlung - erzeugt die große Spannung in dem Buch und das Verlangen beim Leser, immer weiter und weiter zu lesen. Man kann das Buch einfach nicht aus der Hand legen! Die einzelnen Protagonisten sind übrigens - wie eigentlich nicht anders zu erwarten - sehr gut ausgearbeitet. Auch wenn man nicht jeden in sein Herz schließen kann, da sie doch Dinge tun, die man selber nicht immer ganz so „toll“ findet, macht sie das eigentlich nur realistischer. Denn auch in der echten Welt mag man ja schließlich nicht jeden. Das Ende von Reckless - Das goldene Garn ist übrigens sehr offen. Die Geschichte findet keinen richtigen Abschluss und der Leser wir mehr oder minder von der Autorin einfach hängen gelassen. Dies ist um so ärgerlicher, wenn man bedenkt, wie lange die Wartezeit zwischen den einzelnen Büchern war - und wohl sein wird. Am Anfang hagelt es zahlreiche Schläge ins Gesicht. Das wird eingeführt, jenes begriffen, solches ausgeführt und ein Stolperstein nach dem anderen in den Weg gelegt. Die Situation wirkte aussichtslos und beinahe überladen. Stück für Stück verläuft sich das am Ende alles und es ist ein wenig als würde die Flamme erstickt bevor sie in einem großen Feuerwerk enden kann. Ich mochte den Weg, keine Frage, die neuen Ecken der Spiegelwelt (Russland, Baba Yaga, Zaren, haach) zu erkunden war ein Heidenspaß und wieder sehr originell erdacht und atmosphärisch beschrieben, aber die Schlüsselszenen passierten mir oft zu schnell. Überhaupt geht der Schreibstil an den wichtigen Stellen nicht genug ins Detail. Schwuppdiwupp, schon passiert und weiter durch die Spiegelwelt. Ich möchte gern öfter inne halten und das Erlebte auskosten und verarbeiten. Dazu gibt es zahlreiche Perspektiven von wichtigen Nebenfiguren (die Dunkle, Hentzau, Donnersmarck), die am Ende nur im Sande verlaufen. Ich habe eine ganze Weile gebraucht, um wieder in das Buch hinein zu finden, was zum einen daran lag, dass es schon wirklich ewig her ist, dass ich die ersten beiden Bände gelesen habe, und zum anderen daran, dass das Buch durch die wahnsinnig kurzen Kapitel und gefühlt hundert verschiedenen Charaktere und Sichtpunkte am Anfang wirklich sehr konfus ist. Das Ende war dann aber wieder richtig packend und einfach nur gut und hat den etwas schwierigen Einstieg für mich wieder rausgerissen. Die Spiege Ich habe eine ganze Weile gebraucht, um wieder in das Buch hinein zu finden, was zum einen daran lag, dass es schon wirklich ewig her ist, dass ich die ersten beiden Bände gelesen habe, und zum anderen daran, dass das Buch durch die wahnsinnig kurzen Kapitel und gefühlt hundert verschiedenen Charaktere und Sichtpunkte am Anfang wirklich sehr konfus ist. Das Ende war dann aber wieder richtig packend und einfach nur gut und hat den etwas schwierigen Einstieg für mich wieder rausgerissen. Die Spiegelwelt ist immer noch absolut fantastisch - ich würde sogar sagen eine meiner liebsten Fantasy-Welten - und auch Cornelia Funkes grandioser, bildhafter Schreibstil und ihre tollen Illustrationen konnten mich wieder vollends überzeugen. Does anybody know when this is coming out???? Terzo libro della serie Rekless e, purtroppo, non l'ultimo. Non bisogna fraintendermi, il libro mi è piaciuto, ma mi aspettavo la parola fine alla storia. Anzi, già pregustavo la risoluzione ai mille intrecci... e invece nulla, sono rimasta a bocca asciutta. E chi avrebbe mai pensato ad ulteriori alti due libri?? Chissà se mai verranno pubblicati anche in italiano. Niente da fare, il mondo creato dalla Funke mi piace sempre di più. Streghe, baba jaga, maledizioni, magie, fate, pol Terzo libro della serie Rekless e, purtroppo, non l'ultimo. Niente da fare, il mondo creato dalla Funke mi piace sempre di più. Streghe, baba jaga, maledizioni, magie, fate, pollicini, lupastroli, nani, gnomi, specchildi sono sono alcuni assaggi di ciò che si trova in questo libro. Un mondo fatto di magia, dove il passato è il presente si mescolano e si incrociano, tecnologie e leggende si scambiano di posto. Sulla trama non mi posso esprimere più di quel tanto. Non mancano di certo le avventure, ma sento la mancanza di quella "scintilla" che mi fa stare alzata fino a tardi per finire un libro.